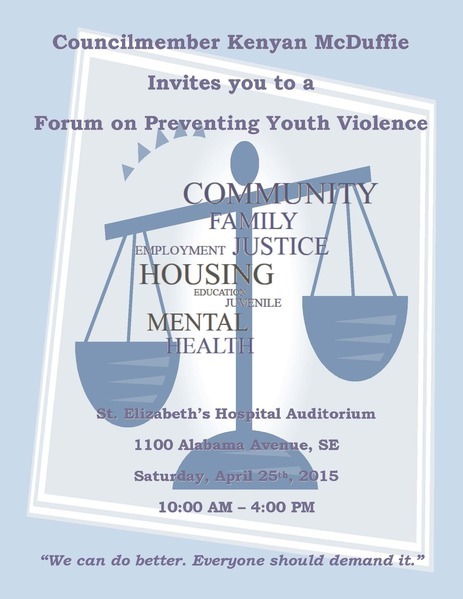 On Saturday, April 25, please join me for a Forum on Preventing Youth Violence. You will have the opportunity to hear different perspectives on the issue from a number of panelists, including our youth, community service providers, and leading experts in the field. We hope that you will be able to attend and participate in the conversation on how we can reduce the impact of violence in our communities. The forum, which will take place from10:00 AM to 4:00 PM, will be held in the auditorium of Saint Elizabeth’s Hospital (1100 Alabama Avenue, SE). In order to properly engage the audience, and learn how to address the unmet needs of our young people, we will be asking those in attendance to provide questions and comments for the panelists. 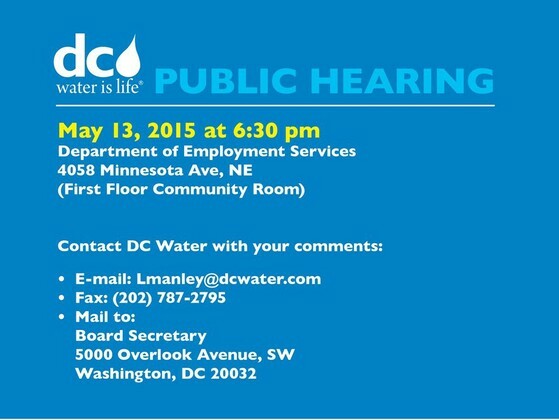 If you have any questions, please contact Shawn Hilgendorf at shilgendorf@dccouncil.us or (202) 654-6183. As I mentioned in my Washington Post op-ed, "many of the initiatives will require residents from all walks of life to buy in to the simple idea that any murder is unacceptable." So please join me on Saturday, and together we can put an end to the violence that plagues neighborhoods across the District of Columbia. On March 31, the Committee on Housing and Community Development held a public hearing on Bill 21-54, the “Adequate Notice of Affordability Expiration Amendment Act of 2015.” This legislation, as introduced by Councilmember McDuffie and co-introduced by Councilmember Bonds, would make changes to notice requirements provided to tenants. Owners and landlords - seeking to raise rental fees based on the expiration of affordability requirements - would be required to provide at least 90 days written notice prior to increasing the rent. The Committee heard testimony from the Department Of Housing and Community Development, the Housing Finance Agency as well as other interested parties, including the Legal Aid Society and MANNA. The bill was received favorably and will hopefully be coming to a vote within the committee in the near future before coming before the full Council. 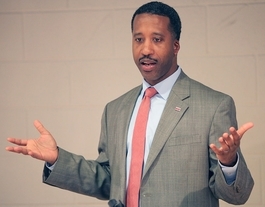 On Wednesday, April 22, 2015, Councilmember McDuffie will hold a public roundtable to discuss legislative proposals relating to the powers of the Office of the Attorney General (OAG) and the Mayor’s Office of Legal Counsel (MOLC). The roundtable will provide the public with an additional opportunity to discuss both important proposals outside of the Council’s budget process. For more information, please visit www.kenyanmcduffie.com. On Wednesday, April 15, Councilmember McDuffie convened the Committee on the Judiciary's first budget oversight hearing of Council Period 21. Interested in attending or testifying at an upcoming budget oversight hearing? Please check out the full schedule on www.kenyanmcduffie.com. Every year, the District of Columbia commemorates the DC Compensated Emancipation Act of 1862, which ended slavery in Washington, DC and freed 3,100 individuals. 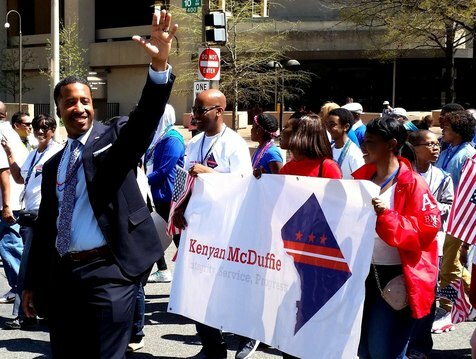 On Thursday, April 16, Councilmember McDuffie participated in the 15th annual Emancipation Day Parade. Thousands of attendees joined the celebration, both in the parade and on the sidelines, along Pennsylvania Avenue. For more information, please visit http://emancipation.dc.gov. On Tuesday, April 14, Councilmember McDuffie attended a public safety meeting in the Foggy Bottom neighborhood. FRIENDS, a group formed in 2002 that aims to establish a dialogue between George Washington University and the community, gathers monthly at meetings hosted by GW’s Office of Government and Community Relations. For more information, please visit www.gwtoday.gwu.edu. 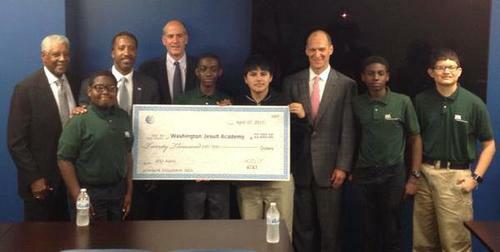 On Monday, April 20, Councilmember McDuffie joined Denis Dunn, President of AT&T's District of Columbia region, to announce a $20,000 contribution to support Ward 5's Washington Jesuit Academy ("WJA"). The donation will help fund WJA's Graduate Support Program, which prepares low-income, male students for their transition from middle school to high school. Participants receive mentoring and academic support, in addition to attending college readiness activities. On April 14, the U.S. Department of Agriculture's (USDA) U.S. National Arboretum (USNA) will once again be open to the public seven days a week, its original operating schedule. USNA continued a full research schedule, but reduced the public schedule by three days a week in 2013 due to reduced funding, closing to the public Tuesday through Thursday. The Arboretum is operated by the Agricultural Research Service (ARS), USDA's chief intramural scientific research agency. For more information, please visit http://www.ars.usda.gov. Fire and Emergency Medical Services ("Fire and EMS") announced a new initiative to recruit more DC residents for a variety of positions within the department. If you are 19 years old, have a high school diploma or GED, and are interested in a career with Fire and EMS, you will have the opportunity to take an exam that provides preferential scoring for local applicants. Interested individuals can visit careers.dc.gov or call (202) 673-7580. 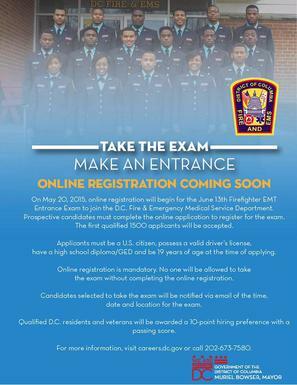 Online registration for the exam will start on May 20th and the exam will take place on Saturday, June 13, at the Walter E. Washington Convention Center. Registration is required and only the first 1,500 applicants will be able to participate. Apply for the DC Community Heritage Project Grant by May 8th! The Humanities Council of Washington, DC is a partnership between the Humanities Council and the DC Historic Preservation Office. This program is designed to provide funding and support to community leaders interested in preserving the history, architecture, and collective memory of their neighborhoods. The DCCHP is local history at a grassroots level, placing control of the narrative in the hands of those who create it. These grants are awarded in mid-June, and the final product is due in October. In December, each DCCHP grantees present their work at the DC Community Heritage Project Showcase and Symposium, a public event celebrating historic preservation in Washington, DC. Past grantees have produced documentary films, oral history projects, digital archives, walking tours, and many other types of educational materials. For more information, please visit www.wdchumanities.org.